Summer is the season for the music festivals and no doubt, the fashionistas all across the country can’t wait to showcase their awesome outfits and music festival is one of the best places to do that. This time it is the Delaware-based Firefly Music Festival we are going to review, so get prepared for the fashion highlights from this marvelous event. This three-day festival gathered about 60 000 music fans, so can you imagine how many amazing outfits were present at the event? The temperatures apparently were rising as the pretty ladies were wearing minimum of clothing. There were also lots of flip flops and that is especially surprising if we remember the looks from the previous music festivals in other parts of the country, like Governors Ball. Well, weather does affect fashion after all. Among the most popular outfits were shorts in their many variations. Like we see in the picture above, this girl opted for awesome neon green shorts with a geometric print monochrome top – very dramatic, don’t you think? There were also cut off shorts, romantic lacy shorts and even star printed shorts among them all. 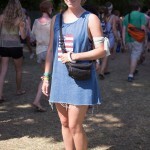 Another fashion highlight from the Firefly Music festival was presented by skirts. There were also many of them present, from the mini to maxi sizes. Bare tummies were also sort of a trend at the event, as many girls were showcasing their flat and toned up abs. Like the girl in the picture above who was wearing a polka dot cropped top with a modest white maxi skirt accessorized only by a pair of sunglasses. So, the floral patterns, geometric prints, cropped tops with high waist shorts and skirts, maxi and mini dresses, and lots of flip flops – that is a general impression from the Firefly Music Festival. Take a look at the girls present at the event, and try to figure out what they all have in common.